The Cook-a-Palooza Experience: Cut Mango Like a Pro! Cut Mango Like a Pro! When dicing a mango the last thing you want to do is peel away all the skin first. It’ll be as slippery as an 80s’rock stars shiny pleather pants. Instead, slice off the sides of the fruit (start each cut about a half-inch away from the stem to avoid the pit). Cut a grid through the flesh of each half down to the peel. 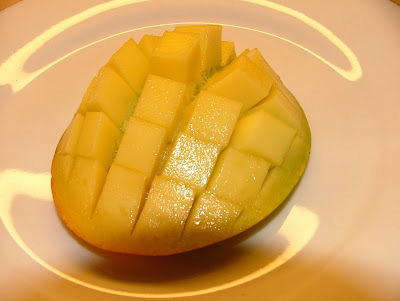 You can adjust the size of the pieces by the size of the grid you cut into the mango. Push up on the peel side so the cubes stick out. Finish by slicing the cubes at their base. Easy with no mess...that's how to cook! Are there any specific fruits or vegetables you would you like to learn how to cut quickly?